A game of wits against the Gods. When wandering the countryside one can't help but feel a sense of awe at the natural order of things. The Gods must truly be in control when everything flows so nicely. Little is known about the world from behind the scenes, but it is far from natural. The Gods need to supply the world below with various natural commodities seen day by day (suits from the cards). Unfortunately, it's a hard knock life for you as an assistant to the Gods… they are always bickering over how it's to be done. Remove the Excuse (placing it face up on the table) from the extended deck and shuffle the pawns and courts together. Deal one card from this mix to each player, face up. This is your Influence. 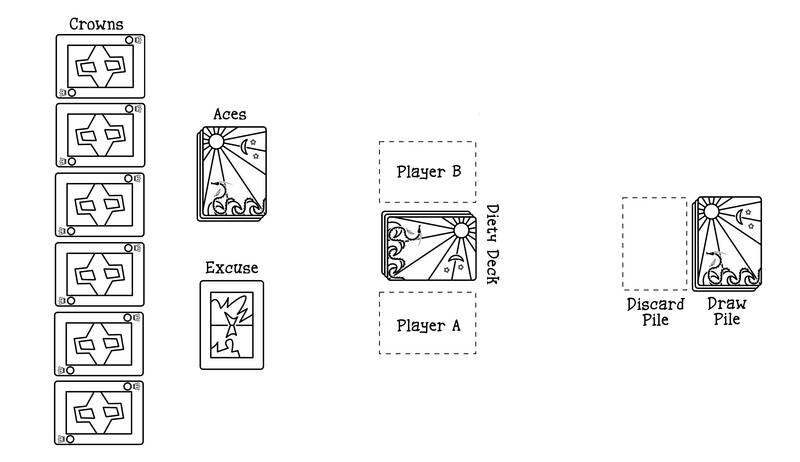 Each player receives three suit chips; one matching each suit on their Influence card. The remaining extended deck goes face down in the center of the table. This forms the Deity Deck. Remove Aces and Crowns from the Decktet and shuffle the remaining cards. 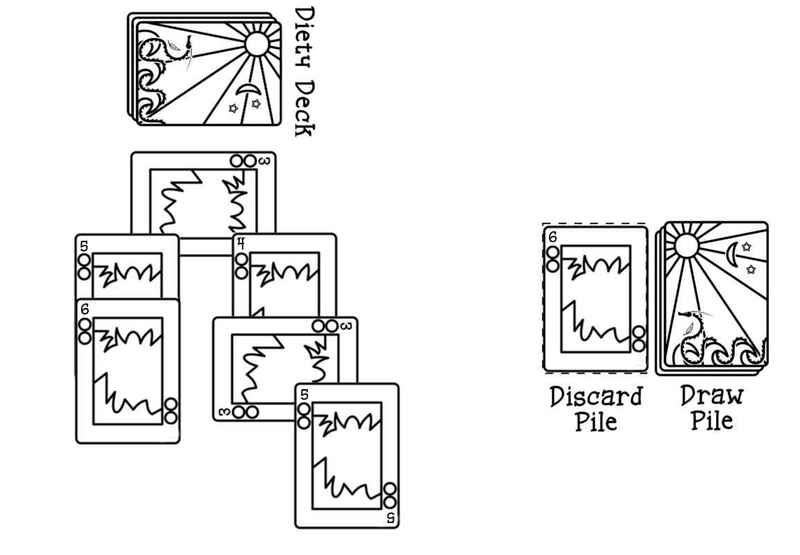 Deal 5 cards to each player, and the remainder forms a draw pile to the side. The Aces are shuffled and placed face down, opposite the draw pile (to avoid confusion of which is which). This forms the Wrath Deck. The Crowns are placed face up, on display, and spread out (near the already displayed excuse card). Fig. 1) The initial layout of the game. You are an assistant to the Gods, and trying to form the longest system of piping from the heavens above to the world below. Unfortunately, the Gods are bossy, superstitious, and very picky. On occasion you can please them and they will bless you. The pawn or court handed to you is your Influence, and is the Influence you have on the world below. These three suits are what you will receive blessings (points) for if you channel them down to the world below. You may acquire more suits if you have the means, or even form a power suit of one you already own. Cards will be placed face up from your hand starting near the Deity Deck and coming back in the general direction towards yourself. The first card played (on its side) is the Foundation Card on which your piping will flow and has two outlets (one matching each suit on the card). 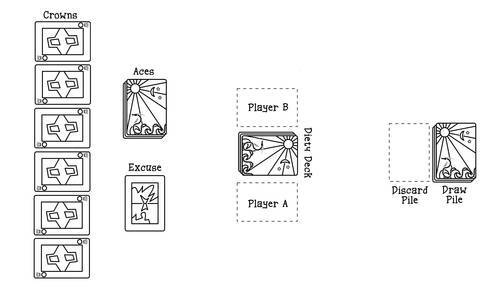 All Foundation Cards are played on their side to signify that it has the two outlets to play from (more on this below). Subsequent Foundation Cards firmly set the pipes above them — never to be broken. Place a card on your piping network. If it's your first turn, pick any card you think reasonable to be your Foundation Card. Every turn after that, you must match one of the suits on the previous card. If you happen to play another Foundation Card (matching rank as your first Foundation Card) then you may turn it sideways to split the branch of the piping into two and bring you more options of flow. If you can't play a card onto your piping network, then you must discard one face up onto the discard pile. Draw a card. 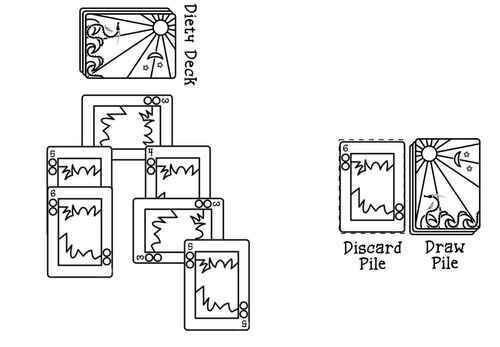 You draw one card form either the designated draw pile or from the top card of the discard pile. To avoid turn confusion, the drawing of a card signifies the end of your turn. Make sure your turn is completed before you draw a card. Pay tribute to the Gods. Pay 1 suit chip to the general supply and flip over a card from the Deity Deck (see below for further instruction). Purchase the excuse for 2 of any kind of chip. If someone already owns the excuse, then you can purchase it from them (they may not restrict this action). To do so you give one chip to the current owner of the excuse and one to the general supply (see The Excuse below). Fig. 2) An example of your piping network after a few turns have gone by. The rank of the card played sums to exactly 13 with any other ending to a pipe (and only the ends) on the table (you and your opponents' pipes), the Gods are angry with everyone and the top ace is flipped over from the Wrath Deck. If the Wrath deck ever runs out, simply reshuffle it. The ranks are in consecutive order (up or down), you're individually blessed with a suit chip of the matching suit used to play the card. The rank of the card played sums to 7 with any other ending to a pipe on the table (including your opponents), the Gods are pleased with everyone's work and a Deity card is flipped over. If the Deity deck ever runs out, simply reshuffle. If after resolving 1. you end up removing another 1., or a 2. or 3. then you don't resolve it if it was removed. If at anytime, someone plays a card down and it sums to 13 with any other pipe's end on the table — the Gods lash out with anger. Flip over an ace from the Wrath Deck and the lowest ranked card that matches that suit on the entire table will be broken and all cards below this (if any) will be discarded. Simply wipe upwards from the bottom of the pipe until you reach the broken card and set all these in the discard (i.e. the broken pipe will be on the bottom as it's set on the discard). There is a way from keeping your pipe from breaking, see The Foundation Card(s) later. It may happen that no pipes match the suit of the ace flipped over, this is fine. Just carry on. You can increase the number of suits you Influence by purchasing Crowns for 3 matching chips of that Crown's suit from the supply. If someone already owns that Crown, then it is not for sale. This also gives you an option to buy one you already have on your Influence Card to form a Power Suit. In the case of a Power Suit, you score two points for each matching suit in your pipe if/when the Deity Deck supplies your network with flow. There is a chance a Deity Card is flipped over and you will score zero points… in this way it is very advantageous to buy Crowns. It has two paths to then go from to branch out your piping even further, one path to match each suit. Just place the Foundation Card sideways to you normal piping to signify it is a Foundation Card and that it has two outlets. Both sides of the Foundation Card(s) are used to check for sums of 7's and 13's. It should be said then, the original Foundation Card can never be broken by the Wrath of Gods. If you don't have the means of a Foundation Card to protect your precious work, you may purchase the Excuse Card to behave as one. The card may not be built upon (i.e. no card below it) and may be purchased away from you by other players. It may also be subsequently returned to the side at no cost or penalty. When the Draw pile is gone, the discard pile is …well, discarded. This leaves only the cards in your hand to finish the game. The game continues as before, without the drawing of cards at the end of your turn, naturally. Before this, the end of your turn was signified with the drawing of a card. Now the turn must be verbally handed over after the check of 7's and 13's. You pay tribute to the Gods on your turn and flow is issued through your network individually. Anyone plays a card that sums to 7 with any other end of a pipe, flow is issued through everyone's pipe, and all score together. You score points when a Deity Card is flipped over and matches suit(s) with your Influence Card. You then sum up how many of that specific suit is in your network. Crowns increase the number of Influence you have and can even turn a suit you have into a power suit, where that suit is counted twice for each one in you network if supplied by the Gods. I find it easiest to use a 20 sided dice (D20) to keep score. Just roll it up each time you score. Use the 13's to your advantage, by watching your opponents branches carefully. Especially, when the wrath pile is short and you think you know what the next suit is going to be. I tried paying tribute every time I had a token, and my wife still beat me. So… that doesn't really work. When a card is played, is the rank added to each individual card in the piping networks? No, just the ends — including the foundation cards — are added to the current card played to check for 7's and 13's. Can you play cards below the Excuse? No, this card is only used if you need to quickly (and temporarily) set your pipe to avoid any Wrath of the Gods. Help with theme was offered by P. D. Magnus.